Today I wanted to focus more on their drawers. 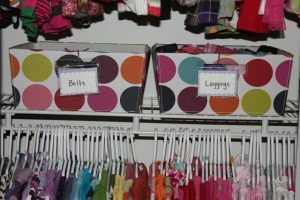 And because my younger daughter only has 1 small dresser, I wanted to show you how I created more “drawer space” in her closet. I mentioned in (yesterday’s post) that I decided to hang all of her shirts. I then rolled up her leggings and sweat pants and tucked them neatly inside these bins. I found a piece of foam board and cut it (not very neatly obviously) to the width of her PJ drawer. I then covered it with the same wrapping paper that I used to line the drawers. I then simply shimmied it down the middle of the drawer and added some chalkboard labels. Now it was ready to put tops in on one side and the bottoms on the other. The best part about this is my little one can pick and pull her jammies all she wants and I’m not going to make a fuss. Some battles are just not worth having. As long as they aren’t on the floor, I am happy. I used the same wrapping paper as Lil’ Sis to line the drawers (just makes for a fun surprise when you open the drawer–don’t you think?). The best part is that everyone knows where things go–including hubs. Hear that honey? ? Well, along with making the drawers a little prettier and more functional on the outside, I decided to rethink the inside a little as well. First I switched things around a bit, putting shorts up in a high drawer (because we have enough drawers and there is an occasional warm day where they may be needed) and pants and long sleeve shirts down low where my soon to-be-five-year-old can reach them. I used to roll her shirts and while I like this better than just stacking them on top of each other, I was running out of room. So, I decided to fold and stack them horizontally. This makes it so much easier to see what she has and we still have plenty of room to add to if needed. Stay tuned tomorrow to see how I made some easy, fun closet dividers…..